This week, UC Davis came out with a finalized version of its Long Range Development Plan (LRDP). The last three years of discussion have focused on student housing and the role of the university. While there is clearly some frustration on the part of the leadership in the community as well as the citizenry on the responsiveness of the university, it appears that modest progress has been made on the university providing its students with housing. In its earliest draft, the university would not commit to a number of students it intended to house, but it did commit to less housing than student growth. That was not acceptable to pretty much anyone and eventually the university increased its allotment to 6200 then to 8500 and finally to 9050. While 9050 is clearly short of 50 percent of total enrollment housed on campus, UC Davis does get to 48 percent. Considering they started at 28 percent, that’s not bad. Some have tried to push for that extra 1000, but, from my perspective I am far more concerned that those 9050 beds get built – particularly when we only have plans now for 5200 – than about trying to squeeze another 1000 beds out of the university. The next big thing may be the push by the city to get the university to compensate or enter into an agreement with UC Davis to mitigate its impacts. This was a central piece in Dan Carson’s successful council campaign, and something that UC Santa Cruz and UC Berkeley have entered into with their host communities – to varying levels of success. This is largely true from the standpoint of the LRDP. 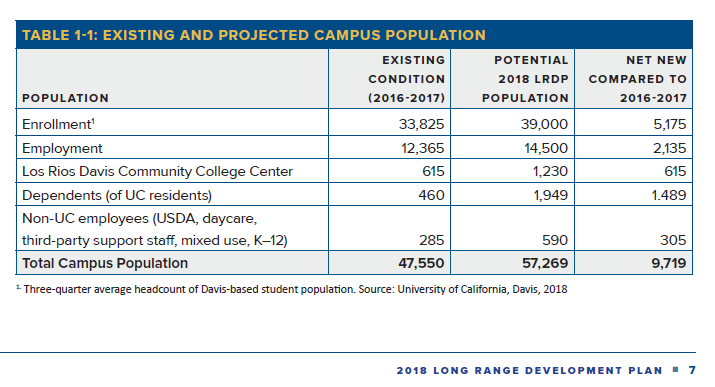 UC Davis will be adding around 5000 during the next 10 years, according to its LRDP enrollment forecast. In 2016-17, the university housed about 10,000 students on campus. It plans to be at just over 19,000 by the time the LRDP is done. That means that the LRDP should reduce the number of students living off campus. From the city’s perspective, this ignores the fact that prior to the LRDP the university had increased student enrollment without adding much in the way of on-campus housing. I would further argue that the city and the university, by providing more housing close to campus, will act to reduce the demand on roads, traffic, and transportation of student enrollment. Right now, with a housing shortage, there are a few huge impacts. One is that a large number of students are crammed into single-family homes in the community. That is causing a number of problems, from parking to police to noise. By building more housing near campus – on and off campus – those impacts will be reduced. Further, the shortage of student housing means more students have to commute from out of town – that causes environmental impacts as well as increased traffic and parking impacts. The more we have students living on campus in places like Nishi and Lincoln40, in particular, the less students will have to drive onto campus and therefore the fewer impacts. I have seen a lot of blame thrown the way of the university – even from those who are not necessarily opposed to more housing in town. One of the key points is that university enrollment growth policies are to blame for these problems. They will argue that university growth is a driver of demands for new housing. That is certainly true. But you could probably extend it further and note that the university is a major driver in why the Davis community is vibrant and attractive to people living in this community. When people look at the impact of the university, many think in negative terms of growth and costs, rather than positive terms like economic engine, high standard of living, employer of a huge number of residents, etc. Leaving that thorny issue aside, a question that remains for me is what should university enrollment growth be? And is 5000 growing too fast? Let us use the city of Davis as a baseline. The city of Davis is considered a slow growth community. We have a growth cap of 1 percent per year. Using 1 percent as a baseline, UC Davis has roughly 34,000 students enrolled right now. That means one percent per year would be 340 students. Multiply that out by 10 and you get 3400 students. UC Davis is projected to add around 5000 students and to get to 39,000 by 2027. That is clearly faster than one percent per year, and closer to about 1.5 percent. There are different ways to look at it. One is that UC Davis is growing about 50 percent faster than the community is supposed to grow. On the other hand, one of the older general plans capped city growth at 1.7 percent. 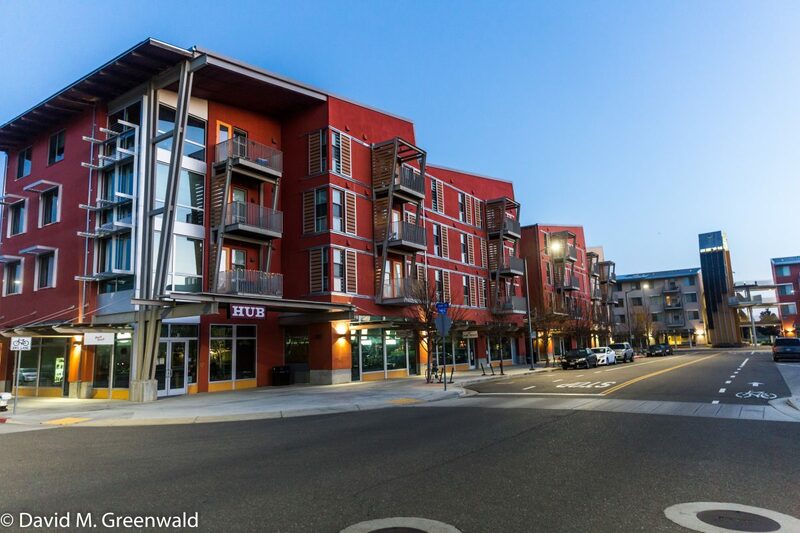 One of the points we have made is that the housing crisis came about because the city slowed its growth and has, in effect, from 2003 to now, not built a new market rate apartment complex – while the university has continued its traditional growth trajectories. A lot of people see UC Davis as the UC with the greatest growth potential in this century, and we don’t just mean enrollment growth. The community does not have that much say over UC Davis enrollment growth, but it is worth us at least entertaining a discussion as to whether UC Davis is being unreasonable in continuing about a 1.5 percent annual enrollment growth for the next 10 years and whether that growth really warrants the need for compensation – particularly when they are building housing for 9000 students and only growing by 5000. Again, not arguing that UC Davis can’t do things better, but at the moment it is difficult to criticize their plan. The biggest question for me is whether they actually build the housing for the 9050 students they are planning to house on campus. Limitations on enrollment is one of the cornerstones of the UC Santa Cruz agreement. That’s why I asked the question that you have not answered, what is a reasonable growth rate (for UC Davis)? I asked what a reasonable growth rate for UC Davis was, I don’t understand your answer. I already provided my answer in regard to the city (e.g., adherence to SACOG requirements, existing city policy). Regarding UCD, I’d say that if they’re planning on the city exceeding those requirements, then they should either limit enrollment (e.g., of non-resident students), and/or build sufficient housing on campus. If I’m not mistaken, UCD was already “counting on” Nishi being approved (not to mention the other student housing developments). In other words, they’re already impacting the city’s plans. It wasn’t clear that’s what you meant when you stated: “we have at least two measures for that…” Fine. So you want it at 1%. It’s 1.4/1.5 percent. A difference of 1600 students over 10 years or 160 per year. Given that, I don’t think their projected growth over the next ten years is unreasonable. You added this in so I want to address this point. First of all, I disagree that a comparison of California’s growth rate is applicable. (A) I support the goal of educating more young people with a UC education than we do today; (B) we would need to look at the growth of the college age population; (C) I also think a regional growth rate would be applicable comparison. But I definitely don’t agree with a straight one to one analysis of California population growth to UC Davis population growth, I think that ends up with a bad comparison. Regarding (A), I have no idea what metric you’re comparing this to. Regarding (C), you’re advocating a growth rate that would make Davis’ growth rate similar to that of surrounding areas, such as Natomas, Elk Grove, etc. I’m reasonably confident that most Davis residents would reject that. You’re on a continual mission to expand the size of the city, which exceeds existing requirements, policies and plans. Note that as the number of students increase, so does the number of those working at UCD (and commuting into Davis, which you’ve already cited as a concern). The question is the definition of reasonable. For you it is 1 percent. I’m not advocating for anything, but simply suggesting that the difference between what you (an extremely anti-growth individual) considers reason and what they actually didn’t isn’t widely variant. Therefore, I conclude that their proposed growth is not wildly unreasonable. I have no mission to expand the size of the city, the university is accommodating all of the projected enrollment growth on campus. I don’t consider adding student housing – especially in infill projects – expanding the size of the city. In reference to my 8:33 post above, it should be noted that a comparison of UCD’s growth with the regional growth rate would assume that UCD is primarily a “regional” university. Also, if UCD is specifically targeting/increasing its enrollment of regional students, this will increase the number of student commuters (as it’s less likely that they would move to the city or campus). Are you referring to UCD’s enrollment growth? If so, that’s not what I said. However, I did say that if UCD is planning to continue to grow faster than the city, then it should either consider limiting enrollment growth (e.g. for non-resident students), and/or build more housing on campus. The appropriate comparison is the total number of undergraduate students enrolled at UC (all 10 campuses combined) with the number of college-age students in California. As the number of college-age students rises, so will the total enrollment at the UC. Since some of the campuses have reached functional capacity for undergraduates, those that have not (such as Davis and Merced) will need to expand at a greater rate to make up the difference. The obligation of the UC is to the people of California, not the no-growth faction in Davis. The appropriate comparison is the total number of undergraduate students enrolled at UC (all 10 campuses combined) with the number of college-age students in California. As the number of college-age students rises, so will the total enrollment at the UC. If you look at that data there, you can see the pressure on enrollment. As they note, the number of high school graduates has increased by 100,000 in the last fifteen years. By 2040, the number of college-age state residents will increase by another 190,000. With higher high school graduation rates among Latinos/Latinas, enrollment pressure on colleges will increase from that demographic. Bottom line: regardless of how California grows, we have a reasonable projection of the increased need for college space at community colleges and state universities. Don: I’m not seeing where the number of college-age students will increase by 190,000 by 2040. Of those, there is no breakdown regarding who will 1) attend college at all, 2) attend a UC, and 3) attend UCD (e.g., in excess of the LRDP, if that’s what you’re implying). This also totally ignores the pursuit of non-resident students, by UCD. I’m not seeing where the number of college-age students will increase by 190,000 by 2040. I just did the math. Here’s the relevant data. Add up all the 1000’s on the right column, deduct the 1000’s in the left column. Correct, those are different statistics. This was simply in furtherance of the principle that it is the growth in college-age individuals that is relevant, not the growth in California’s overall population. Also, what about the newest UC that is (no doubt) still welcoming growth in enrollment (UC Merced)? How do these factor into your numbers? This also ignores the impact of decisions to limit enrollment at other UCs, such as UC Santa Cruz. That simply increases the enrollment pressure elsewhere. Might that be considered an “arbitrary” limitation, by some? It increases the enrollment pressure elsewhere. What other communities will do about it is up to them and how they collectively value the benefits of providing college education to young adults vs the impacts enrollment growth will have on them. Hence the debate in each of those communities. We have seen that some enrollment growth may be pressed on them by the legislature and by the UCOP. Ron, to the best of my knowledge (and I could be wrong, but I don’t think I am), UC-systemwide enrollment change targets are set by the UC Office of the President (UCOP), and then each campus conducts a dialogue with the UCOP about their ability to absorb a proportional share of the systemwide goal. Some campuses, like UCLA and UC Berkeley are severely constrained in their ability to shoulder a proportional share. It is not that those campuses choose to “limit” their enrollment, but rather that they face “limitations” in their ability to shoulder enrollment increases. Two UC campuses face no such “limitations” UC Davis and UC Merced. As a result, in order to achieve the UCOP target, the proportion of the total target actually shouldered by those two campuses is high. To address your question about UC Meced, the relative national and international reputations of those two campuses affects the marketplace demad. UC Davis’ much higher national and international reputation produces a further upward pressure factor on UC Davis enrollment. Matt: That sounds reasonable, but doesn’t account for what might be viewed as “arbitrary” decisions (such as at UC Santa Cruz’ agreement to limit enrollment). It also does not account for the (likely) welcoming of new enrollments, at UC’s newest university (Merced). Regardless, I have heard that courses/classrooms are already impacted, at UCD. Also, International enrollment is probably the most vulnerable to changes, over time. (Due to other opportunities, improvements in universities in home countries, changes in exchange rates, political events, etc.) “Hanging your hat” on continued International enrollment (which is already questionable to say the least, regarding the impact on the city) seems like an ill-advised pursuit, from the perspective of the city. If I’m understanding you correctly, you’re adding up percentage changes, and then deducting numerical changes. This doesn’t make sense. In any case, I’ve just about forgotten what your point is. You’re not. Just look at the numbers in the “Change from 2010, 1000’s” part. Add up green bars (331,000 more), deduct red/orange/yellow bars (143,400 less). Equals 187,600. I rounded to 190,000. The result will be equal to “nonsense”. You’ve now clarified it, to exactly what I suggested (using one column). And, came up with the same result as I did. But again, whatever point you were trying to make is losing steam, as this goes on. whatever point you were trying to make is losing steam, as this goes on. The number that matters in comparing UCD’s growth is the growth in the total number of college-age people in the state. Ron said . . . “Hanging your hat” on continued International enrollment (which is already questionable to say the least, regarding the impact on the city) seems like an ill-advised pursuit, from the perspective of the city. Hanging their hat on International enrollment as an incremental revenue generator is very solidly “advised” as long as the higher education supply/demand curves continue as they currently are. With that said, the Trump v. China trade wars may give UCOP some heartburn. The status point you make is moot in my opinion. To all intents and purposes UCD’s reputation as the #1 Agricultural University in the World makes UCD just as “prestigious” as any of the other campuses. And in the end, once you get back to China with your newly-minted degree, as long as it sn’t from Riverside or Merced, it is sufficient as the desired credential. “Of those, there is no breakdown regarding who will 1) attend college at all, 2) attend a UC, and 3) attend UCD (e.g., in excess of the LRDP, if that’s what you’re implying). Oh. My. God. I give up. Exactly the reason that the city has to look out for its own interests and goals, and take whatever action is deemed appropriate. A commenter (Rik Keller) previously posted a number of interesting comparisons, including one which showed that UCD’s enrollment growth rate from 2010-2017 was almost 4 times greater than California’s population growth rate. Not sure Rik is correct. But UC Davis in their LRDP lists their enrollment at 33,825 (which I rounded to 34,000) and their 2027 project as 39,000 which I rounded to a 5000. That puts their enrollment growth significantly lower than what Rik had it. That is still faster than California’s population growth, but that may not be a meaningful comparison. Regardless, the project growth is at 1.5%, as I ask in my piece – is that projected growth reasonable? If not, what is? If you’re going to dispute what Rik noted (a UCD growth rate that was 3.9 times California’s growth rate from 2010-2017), then the information you’ve provided does not actually show that. It’s incomplete. The information I provided shows that his enrollment figure was too high. David, both numbers could be correct, just simply using different assumptions. I don’t have Rik’s numbers at my fingertips, but I do know that the LRDP excludes a substantial number of total UCD enrollment (35,778 in 2016-17) from its numbers. Virtually all of those exclusions are from the Health Sciences enrollment in Sacramento. I spit out my coffee reading this from Ron. David is “on a continual mission to expand the size of the city”? LOL. No, Ron is on a continual missions to prevent any and every significant increase in size of the city. It is my belief that people like Ron who assessed their opinions about Davis before moving here made a big mistake in not recognizing that the Sacramento area would end up one of the fastest-growing regions in the nation, and that the changes to the US economy (ironically enabled and promoted by the tribe of politics that Ron belongs to) would drive more young people to needing a fine undergraduate and graduate degree at great schools like UCD. But admitting you made a big mistake is difficult for some… and impossible for a few… hence the continued mission. I think Ron needs to recognize his mistake and start deciding if he wants to stay in the larger Davis or move away to something smaller and more stable in population. I am much more happy living and working in this town during the summer break. I don’t hear cars racing up and down the street around my house. There are not kids crossing the street every 100 ft. and I actually make it though some traffic lights without needing to stop at each one. I can go downtown for lunch and find a place to sit for lunch without a reservation. I can ride my bike around down without it being a major sporting event to prevent crashes with pedestrians, bikes and cars. I can find parking spaces downtown, and Cable Car Wash takes about half the time it otherwise takes when all the poor and starving students come back to town. But I know it is only temporary. That without UCD Davis would be Dixon… possible smaller as the center of Dixon is further away from the freeway. So I enjoy the summer break and get ready for the next onslaught of humanity to arrive. It might grow too much for me at some point in the future. I might have to move away. If Ron is still here at that time, I will reach out to him to share my research for other smaller places to live. Because it is always good to collect as much information as possible about where you will call home so you don’t make any big mistakes. I’m thinking of a nice cabin in the remote mountainous area, near Guinda. With newly-improved viewsheds. In all honesty, I rarely feel insulted by your comments. I’m not sure why. Perhaps I ultimately don’t sense a true mean-spiritedness / stubbornness, as I do with some others. Shouldn’t the “newbies” welcome more “newbies”? No doubt the City Council members, senior City Administrators and Planning staff will appreciate the sophistication and depth of your analysis in “assessing the UC Davis impact on the community”. Do you seriously believe the City Council and senior city staff take any joy in framing their conversation with the university around the notions and need for “mitigations”? Is this is the best “analysis” you care to offer – or don’t you really understand what an economically successful and sustainable community looks like to the outside world? John: I’m not sure your point here. The question here is UC Davis enrollment and student housing. I have elsewhere argued for the need for Davis to do a better job of capturing economic development and technology transfer from the university. In large measure, Davis has matured into a purpose-built community in support of the university and its mission. We are what we are because of the university. What has not transpired in Davis, as has in so many university host communities, is the development of a major research hospital or the legions of technology employers – both large and small – who often flock to research university communities. Due to our geographical location, and the community’s historic preference for growth restrictions, we have now arrived at a place where we are out of developable land. The revenues generated from an unbroken, multi-decade long string of 25% plus population growth – from the 1950s through the 1990s – growth has no slowed to a halt. With relatively little by way of native industries within the city limits – other than from our educational institutions – and having run out of developable land – where do we expect our next stages of economic expansion to emerge? It’s a simple question. And, since we are no longer fueling our municipal budget with revenues from those decades of growing population – where do we imagine we will find the increasing revenues required to maintain the status quo we have come to expect? The essential point being that we have neither planned nor structured our local economy to leverage the presence of “Davis based” businesses which not only generate commerce, but also fuel our property tax basis, add to the local payroll, fuel local discretionary spending and are often the creators of increased local wealth within the community. Point being that singularity of purpose can, and often does, have unintended consequences. It’s never too late to recognize those challenges, and adjust with strategic pivots to address the new realities – but it starts with recognizing we have a problem. To make the point even more simplistic, in commercial office developments, people are being paid to walk into the building. For the most part, when they leave the building they have more money in their account than when they entered. In the case of educational facilities development, the students walking into the building are paying for that experience. Their futures will be different as the result, but when they leave these buildings – on a daily basis – they no more in their account than when they entered. When you have amassed a very large percentage of your adult population in this category – it tends to have quantifiable, corresponding impact on the local economy. As a type of land use, student apartments, in and of themselves tend somewhere in between these two examples – but for the most part the tenants are paying for the experience. Other than for the home office, self employed – those exiting the building have no more in their pocket than when they arrived. This is a very simplistic comparison, but it serves to illustrate a fundamental difference between land use activities when viewed through the lens of a municipal operating model, that (following the actual construction phase) some land use activities tend to have more impact and effect on stimulating the local economy, jobs creation and local operating revenues than others. The case is all the more amplified when the majority of employed residents is daily exiting the community – owing to an absence of suitable employment opportunities within the community – and spending the majority of their working hours in a different community with a different taxing jurisdiction. I emphasize this last point – taxing jurisdiction – because it is highly relevant to those concerned with ongoing operations of the local municipal enterprise.